Pepsi has inked Beyoncé for new a multiyear endorsement deal estimated at $50 million, The New York Times reports. But the campaign won't just include TV and radio commercials or magazine and billboard ads. Beyoncé's image will appear on a limited-edition run of Pepsi cans and will receive a multi-million dollar Creative Development Fund for the co-creation of relevant consumer content. 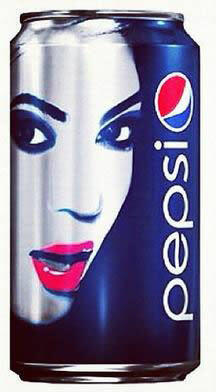 The Beyoncé Pepsi can, developed by both parties, will debut in Europe in March 2013. In recent history, Michael Jackson is the only other person to have his image appear on a Pepsi can. Record labels have reduced marketing and promotions budgets so the Creative Development Fund is especially appealing to a musician. The fund is expected to support the singer's concerts, videos and photo shoots, among other ideas, Lee Anne Callahan-Longo, the general manager of Beyoncé's Parkwood Entertainment, told The New York Times. Beyoncé commended the soda brand for supporting her creative endeavors. "Pepsi embraces creativity and understands that artists evolve," she said in a statement. "As a businesswoman, this allows me to work with a lifestyle brand with no compromise and without sacrificing my creativity." Pepsi and Beyoncé's first project is a "Live For Now" global TV commercial due out in early 2013. Pepsi will also sponsor Beyoncé's Super Bowl XLVII halftime show on February 3. Brad Jakeman, president, global beverage group at PepsiCo, said the partnership is great for music fans. "The global relationship gives Beyoncé multiple outlets to tap into in order to express her creativity, and will attract new consumers to both brands with great new experiences and content," he said. Frank Cooper, chief marketing officer, global consumer engagement, global beverages group at PepsiCo, compared the partnership to other deals. "It is a continuation of Pepsi's relationships with The X Factor, Nicki Minaj and Twitter, where our approach emphasizes co-creation over pure sponsorships," he said. In 2001, Britney Spears signed a $9 million endorsement deal with Pepsi that included a series of television commercials, one for the World Cup, and another that also featured Beyoncé, Pink and Enrique Iglesias. In 1983, Michael Jackson set a record at the time for his $5 million sponsorship deal with Pepsi. In August, Beyoncé and her husband Jay-Z topped Forbes's The World's Highest-Paid Celebrity Couples list, earning a combined $78 million from May 2011 to May 2012.